Peter Briggs for the use of his digital camera, directions to Bradford, accommodation and numerous other forms of support during my stay in the UK. Elwyn Chow for his extensive photo-survey of the props at the Barbican. Close-up of the bridge tower vicinity and surrounding cortex, as viewed from slightly aft of the tower, on the starboard side. The bridge tower vicinity and surrounding cortex, as viewed from slightly forward of the tower, on the starboard side. Wide view of most of the dorsal cortex, as seen from the above and just off the port side. Close and detailed view of the bridge tower and surrounding cortex, seen from the port side. Numerous scanner globes are visible among the diverse functional structures of this region. A distant view of the port side of the bow and the forward end of the dorsal cortex. 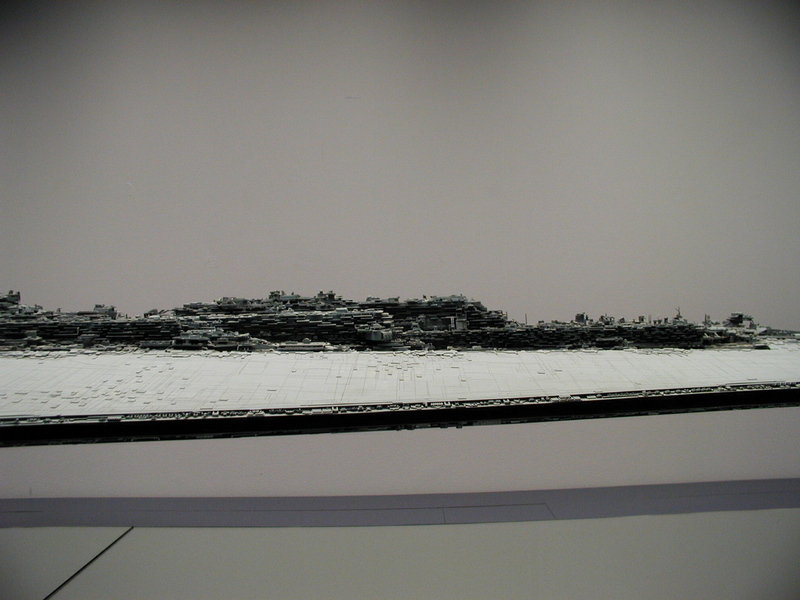 A closer view of the port side of the bow and dorsal cortex, extending over approximately half of the ship's length. 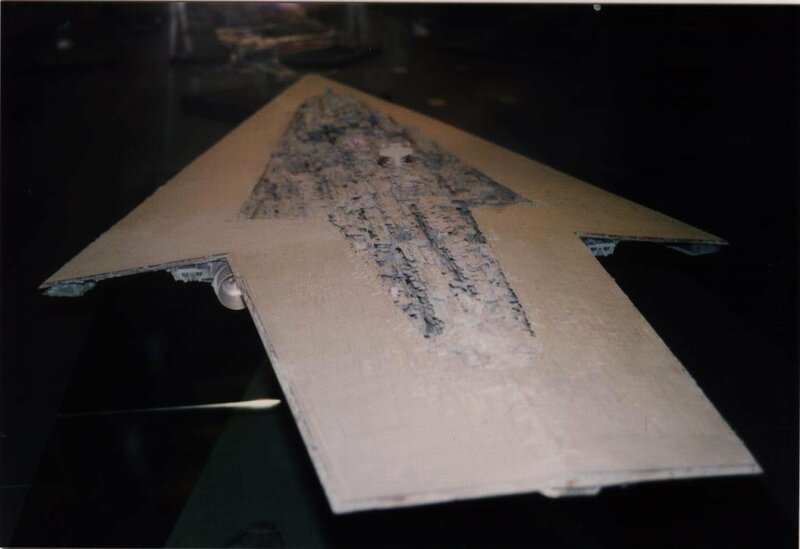 A view of the entire ship showing the important corners of both the object and its image is potentially valuable to any efforts at photogrammetric measurement, because the having two images from the same vantage point effectively contains stereoscopic information. 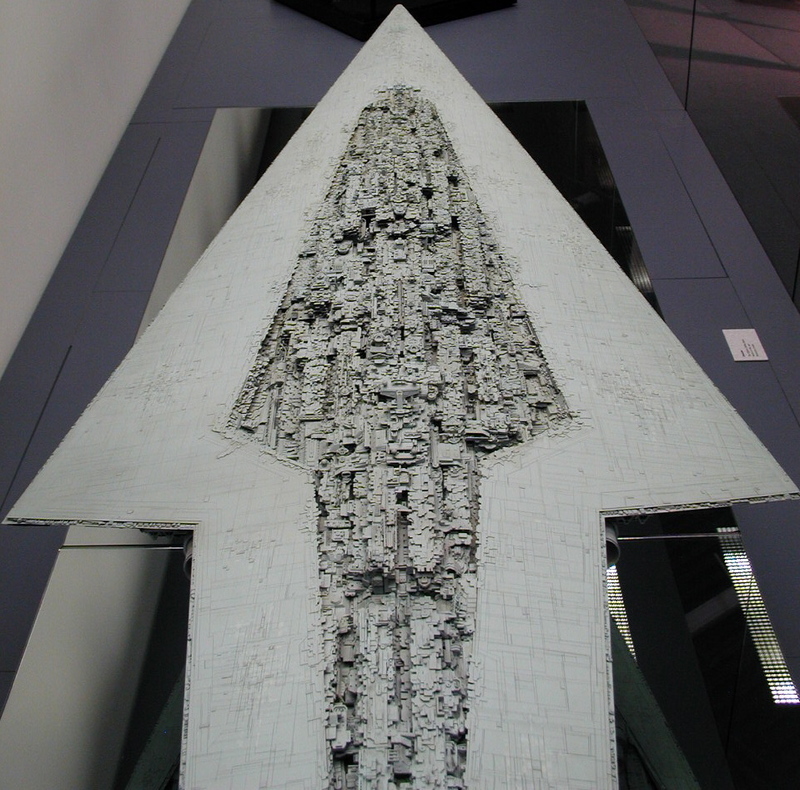 A comparison of corresponding points on the object and reflection, combined with knowledge of the mirror position, will reveal fully three-dimensional coordinates for those structures. 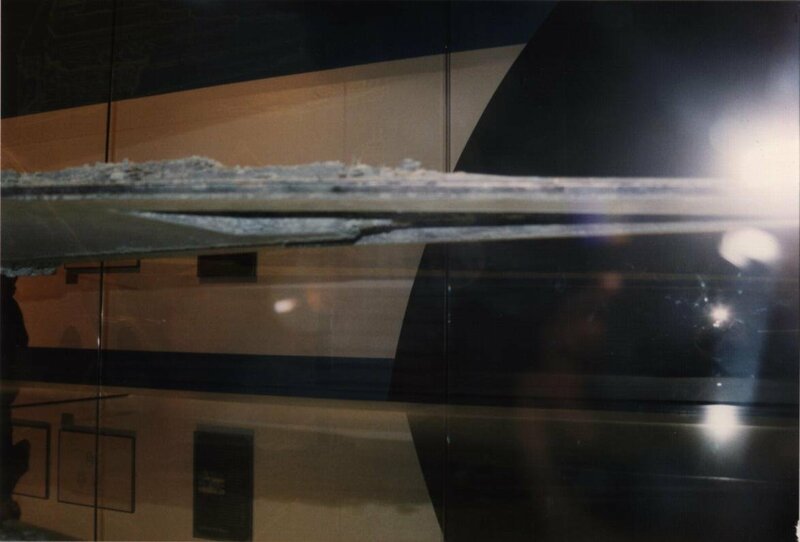 A more complete photo of the stern area and outline of the dorsal hull, with both object and reflection visible. 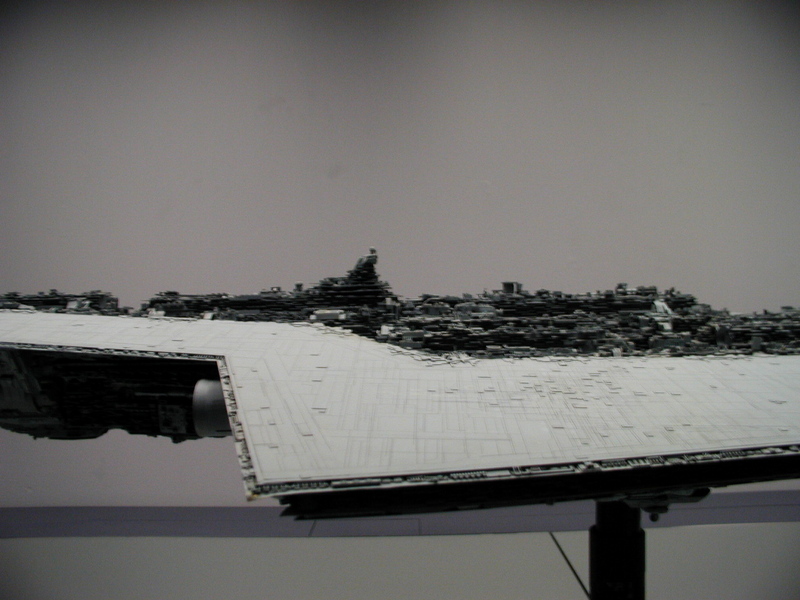 The Executor was at the end of a long case which also contained an X-Wing, the Millennium Falcon and Devastator models. 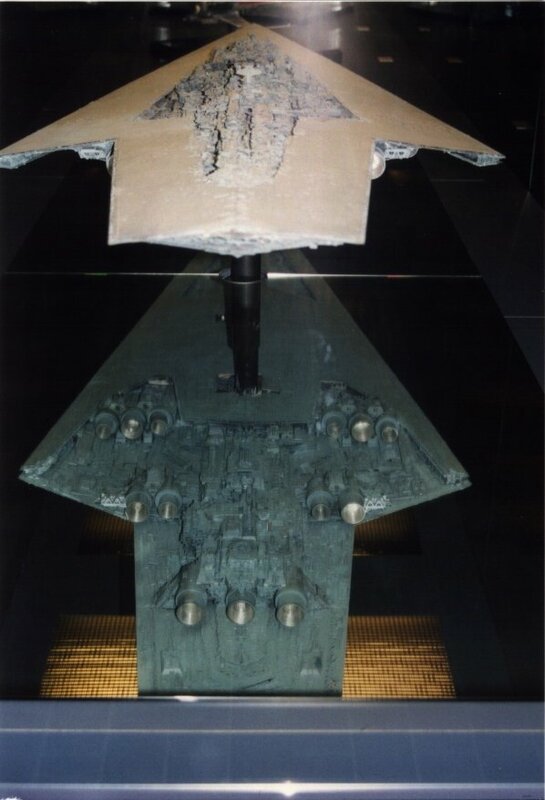 These models, which are interesting in their own right, were an obstruction preventing direct frontal photographs of the Executor. 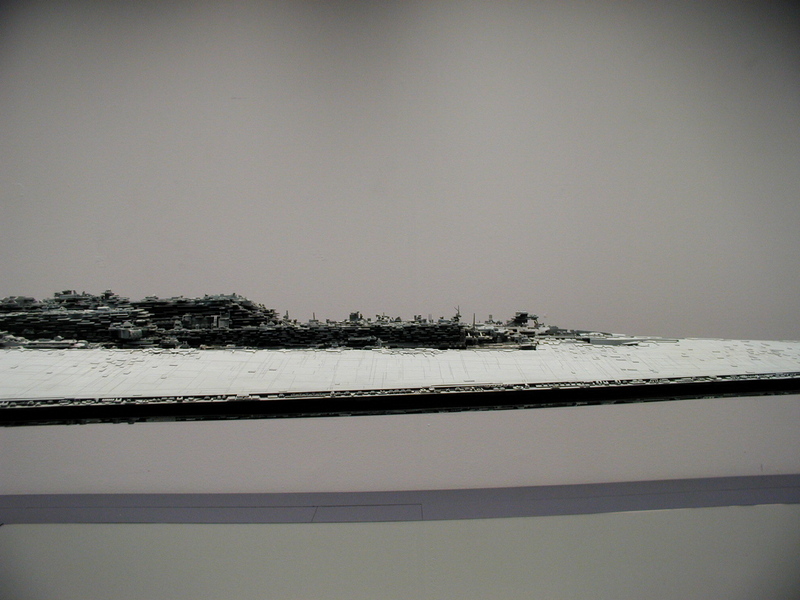 Complete view of the ship from off the starboard bow. The seams of the cases and edges of the mirror may serve as a useful frame of reference. A more distant whole-ship view off the starboard bow. 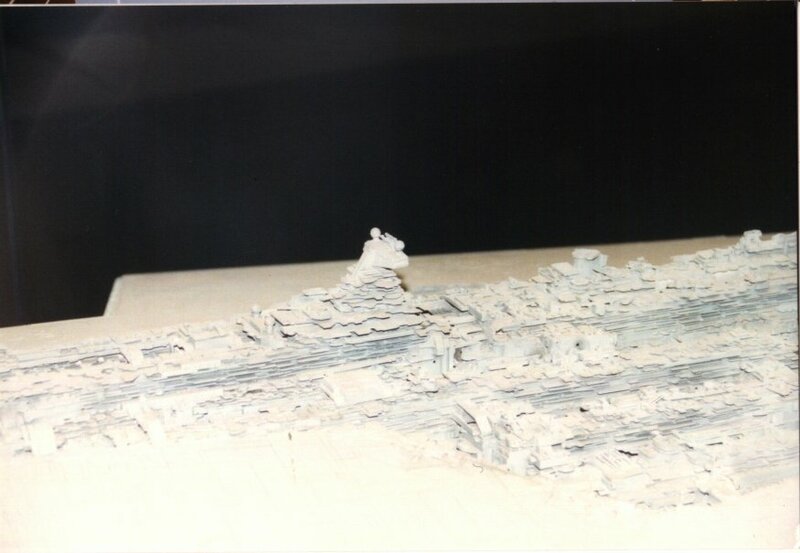 Comparison of the displacements of mirror and case corners between this image and the previous one may help determine the 3D layout. 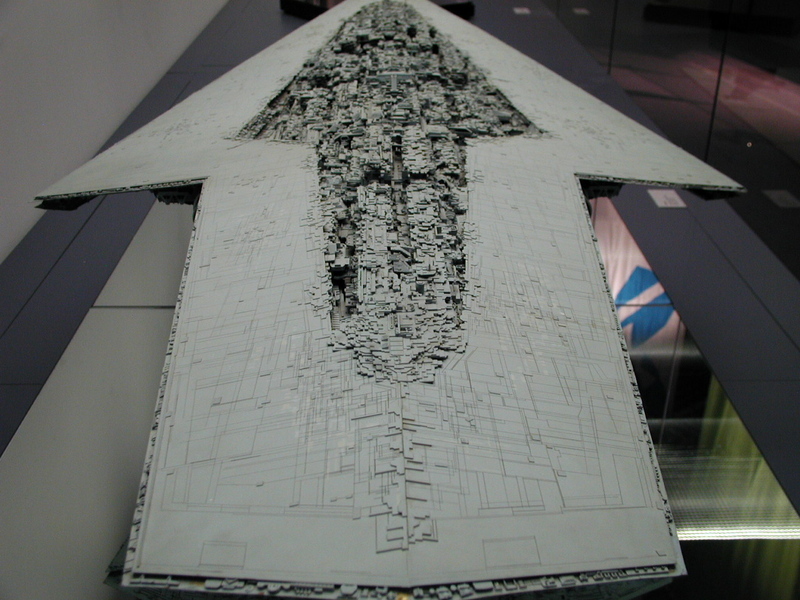 A wide view of nearly the entire profile of the Executor, seen from above the mid-plane, on the starboard side. Wide view from the port side, below the mid-plane, showing clear outlines of the forward engine banks and the main ventral cavity. 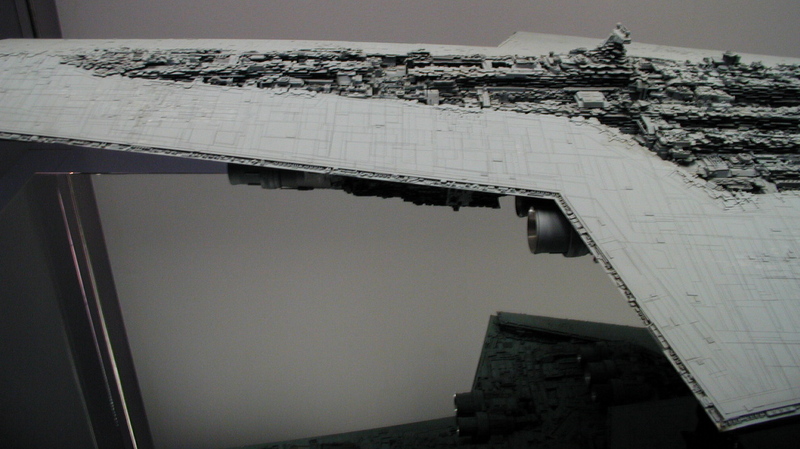 Wide view of the main ventral cavity, seen from slightly below the mid-plane on the starboard side. A whole-ship view from well above the mid-plane, off the port side of the bow. 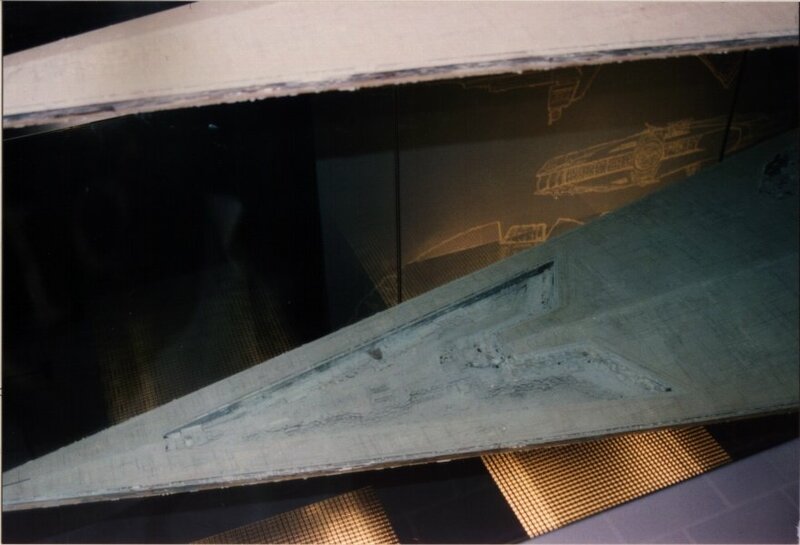 View from the aft starboard corner of the case, with a standard 30cm ruler held on the edge, starting at the lower corner. 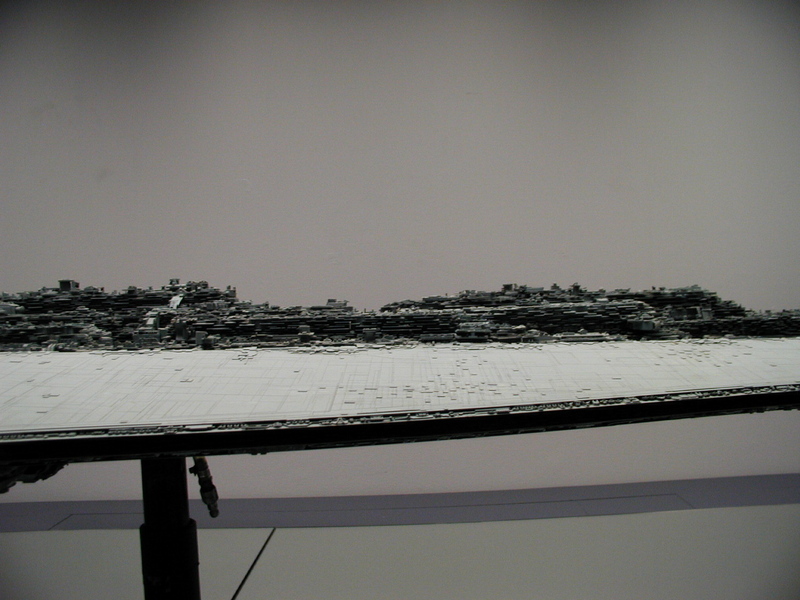 View of the entire outline of the upper hull, viewed from just above the port side of the stern. A view showing large parts of all three rows of engines, seen in a line-of-sight that is parallel to the horizontal plane of the ship. The hortizontality is clear from the narrow profiles of the cortex chips in this view, especially around the bridge tower. 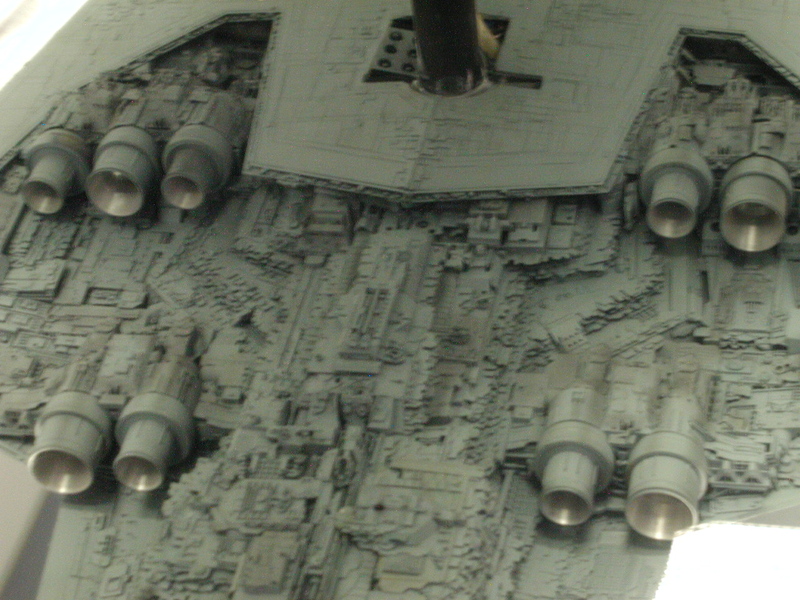 Detailed close view of the engings in the block furthest aft. Starboard side middle aft engines, starboard wing engines and some of the portside engines are visible in the distance. Wide-angle view of the fantail and engines, seen from the rarely seen port side. 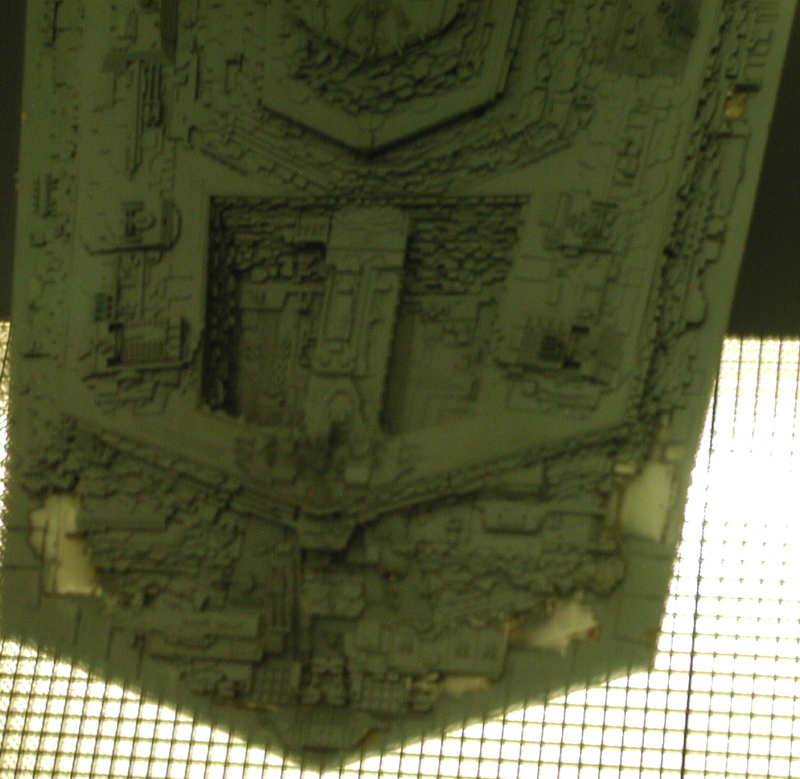 A slightly discoloured vertical surface between the aft and middle engine blocks may be the disguised plug covering a fantail mounting point for the model's internal armature. 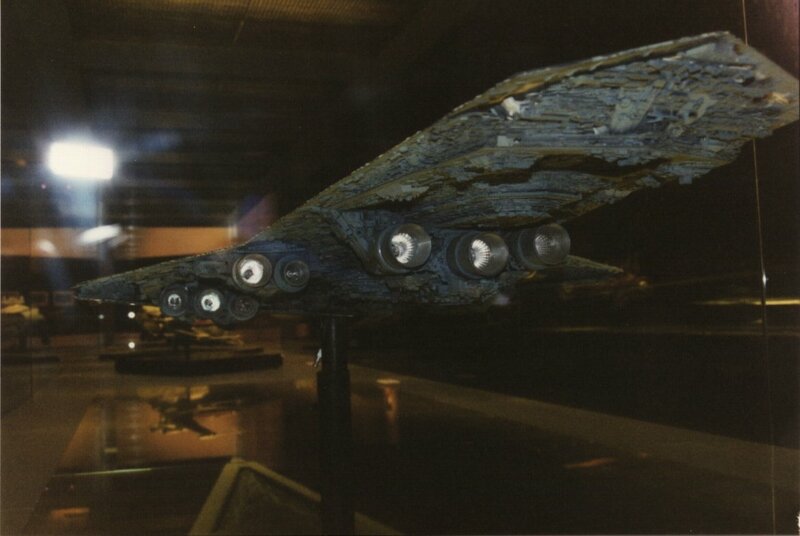 A view of all engine banks from behind, sighting almost directly along the longitudinal axis of the ship (through the central rear engine and the prow). Port side ventral view across the three banks of engines. 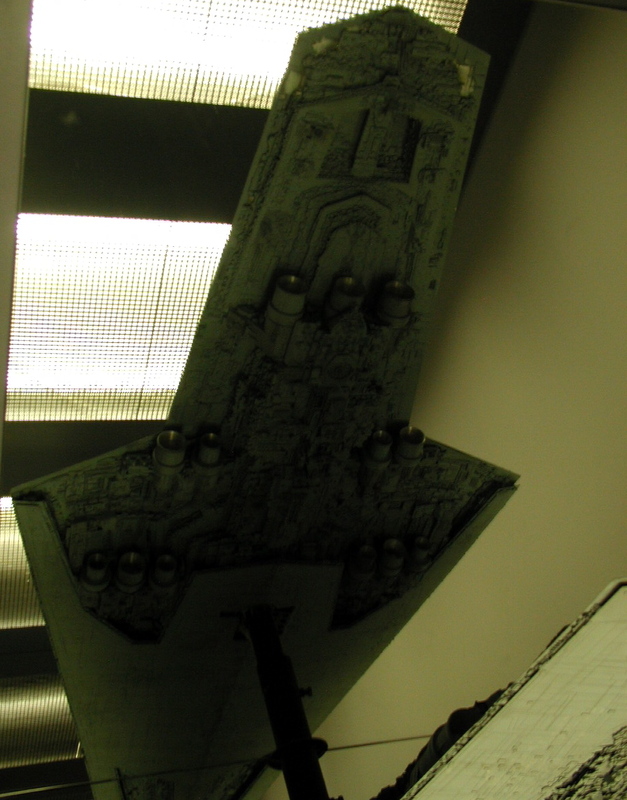 A more distant view of the engines, from the port side and below the mid-plane. View of hte port-side engines, with focus on the forward engine banks. A close view of the very tip of the fantail, sighting directly along the longitudinal-vertical plane towards the bridge tower. One noteworthy rectangular aperture off slightly off to the starboard side (possibly a few mm wide on the model) may be a minor hangar. The rear two engine banks, seen from the starboard side and well above the central plane of the ship. Somewhat unfocussed close view of the front bank of starboard engines, as seen from just off the starboard bow. 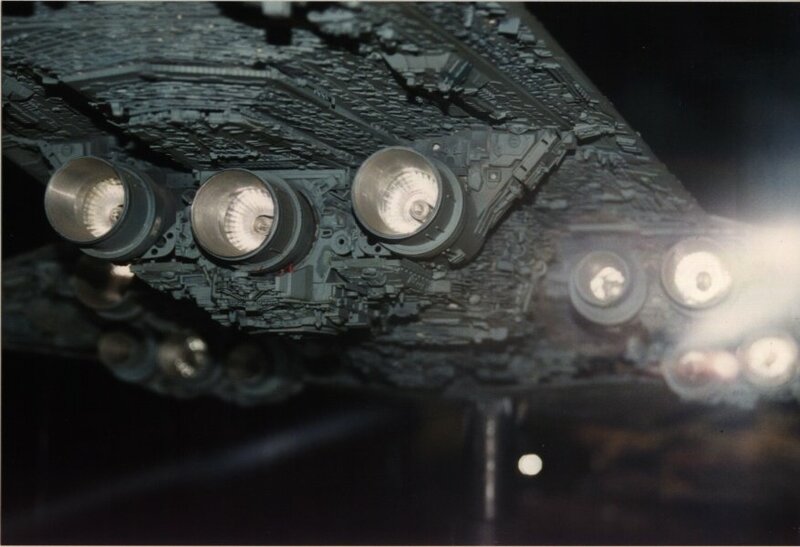 This view gives a sense of how central axes of the engines are displaced vertically. 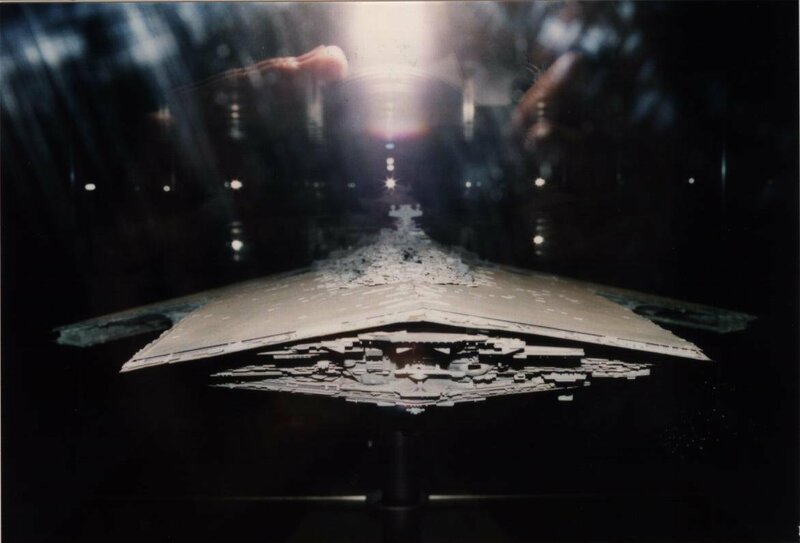 Entire reflection of the main ventral cavity. 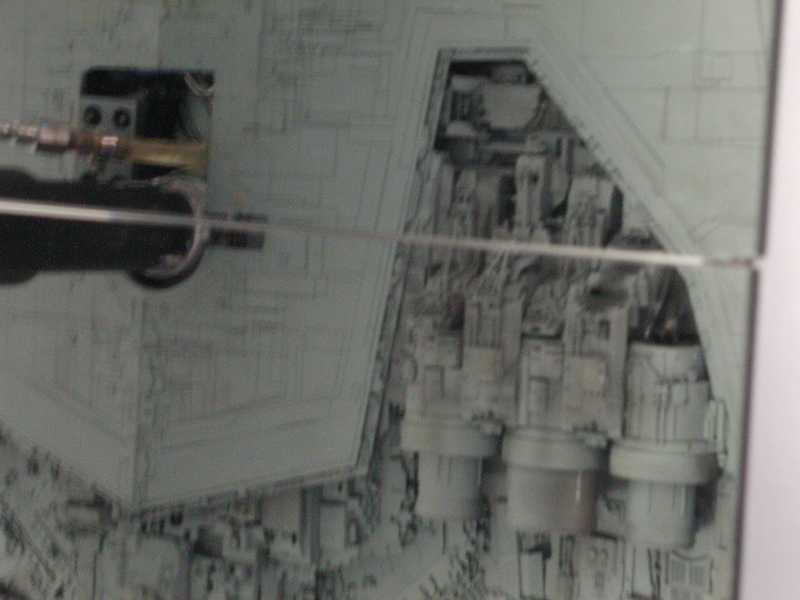 Reflection of the area along the keel line near the engines and the model's support armature. The hole around the armature is not a hangar cavity. 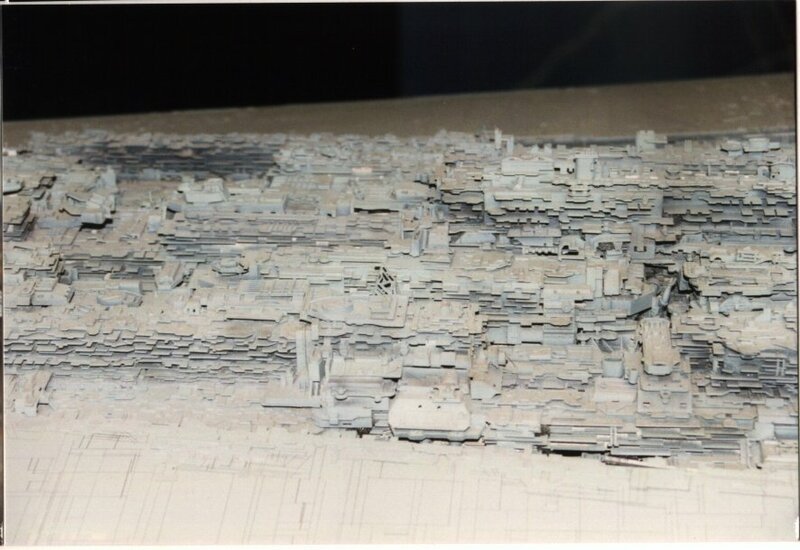 Whenever this area is visible in the movies, it is covered with a plug that blends seamlessly with the surrounding hull. 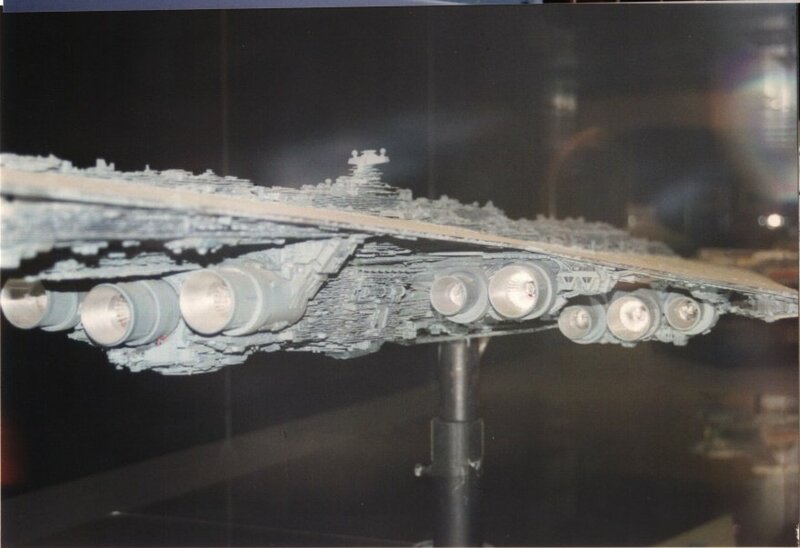 In those shots, the model was supported from an alternative mounting point: either the one on the side of the fantail or the central aftmost engine (these areas also have plugs to disguise the internal armature fittings). 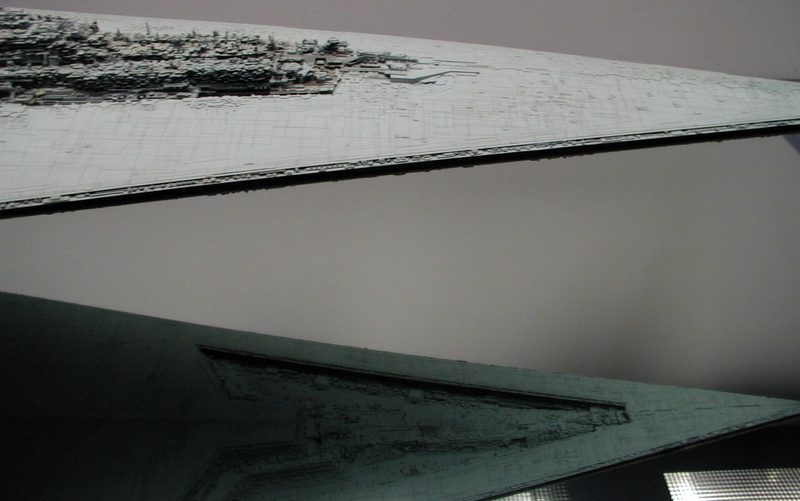 Close-up of the reflection of the main ventral cavity. There are a number of curiously dark spots near the aft end and also near the tip of the forward end of the cavity. Are these just shadows cast by the camera flash, or may some of them be hangar entrances? Scale reference: I use a tape-measure to find dimensions of the display case, which may be useful in any efforts at photogrammetric scaling. 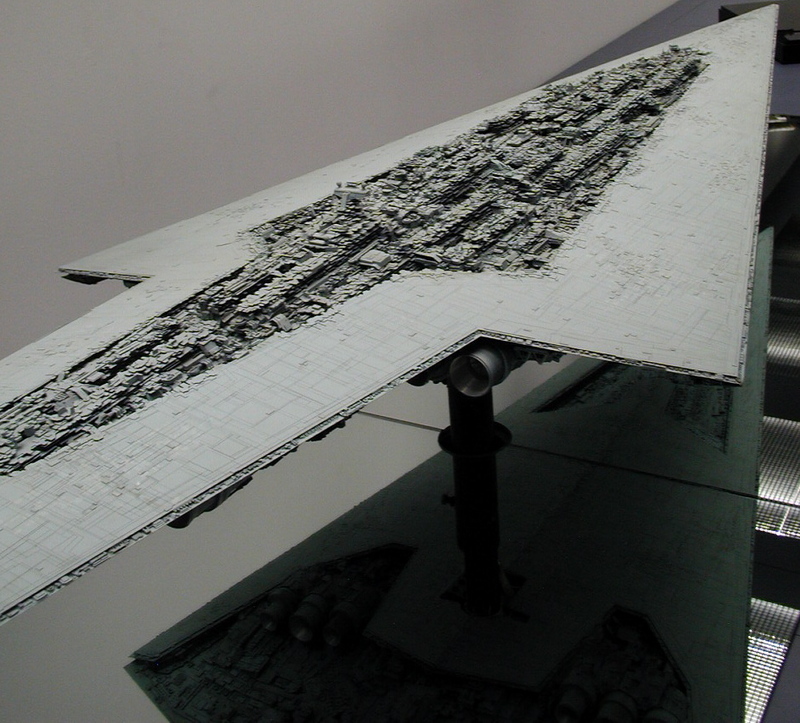 The perspex panel at the Executor's aft is 139cm wide. 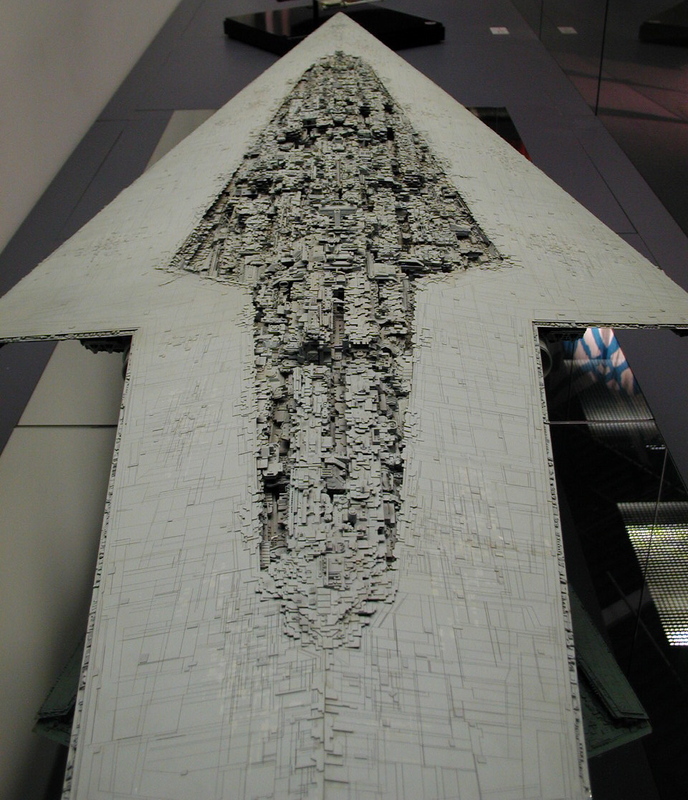 The panels in the longitudinal direction are 100cm wide (ie. 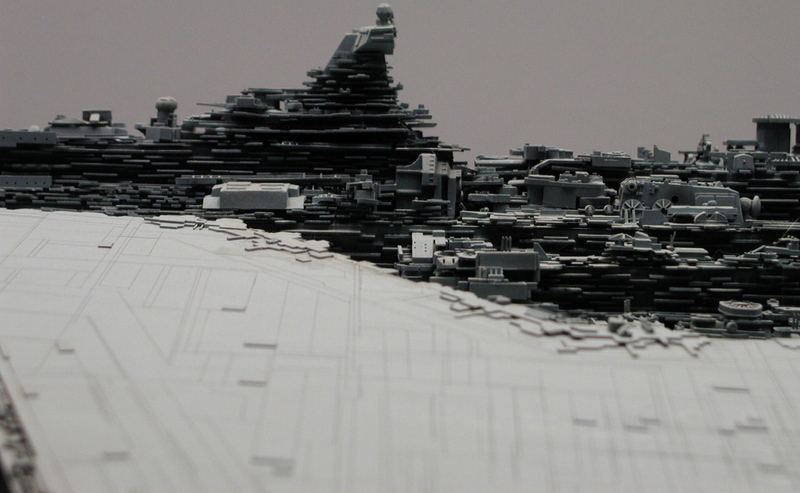 count the longitudinal panels as 1.00m intervals). For practical reasons I couldn't measure the height of the case. Oblique view of the dorsal cortex, seen from above the starboard side. Note the deep rectangular vertical shaft just in front of the bridge tower; its full depth was not visible in the exhibition. Also note the transverse gap in the double row of cortex blocks in the fantail region. Furthermore note that the tops of the blocks are bridged in several places within a kilometre behind the bridge tower. 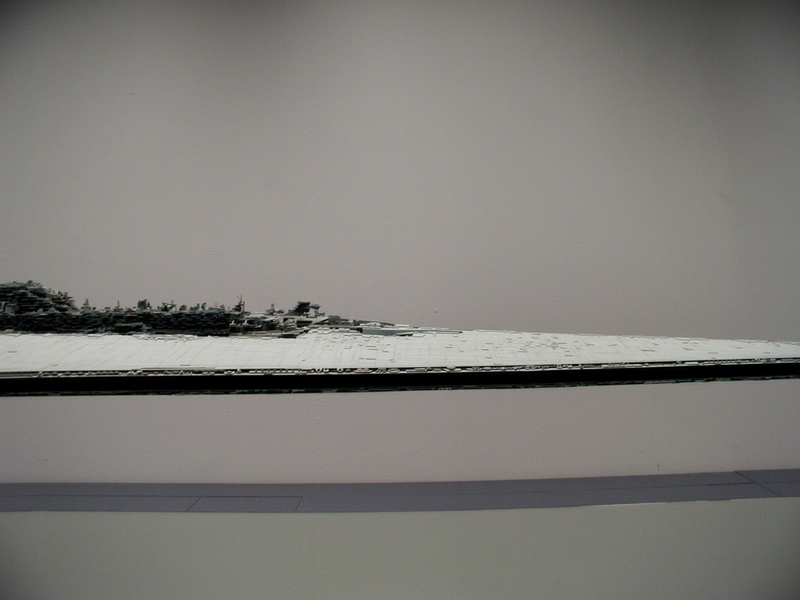 A view related to the one above, except that the camera is pointed more towards the bow. At the widest point, the cortex seems to have six block/rows plus one double-thickness central block. 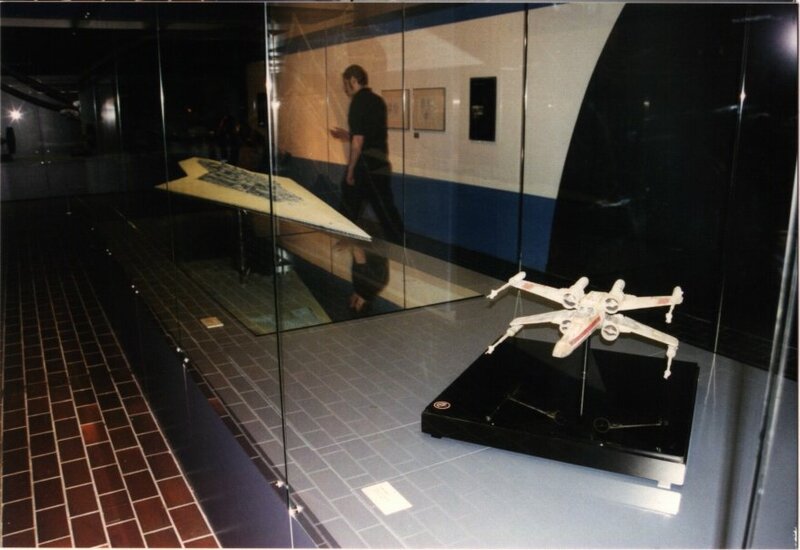 Direct aft view, taken from the back of the exhibit case. Note the gradual merging of cortex chips with the dorsal hull near the back of the fantail: these chips are in a horizontal plane. Other chips of similar thickness sit on the hull at the edges of the cortex gap; they are aligned parallel to the hull plane. Most of these areas are raised by one chip's unit thickness, but there are rare spots with double thickness. 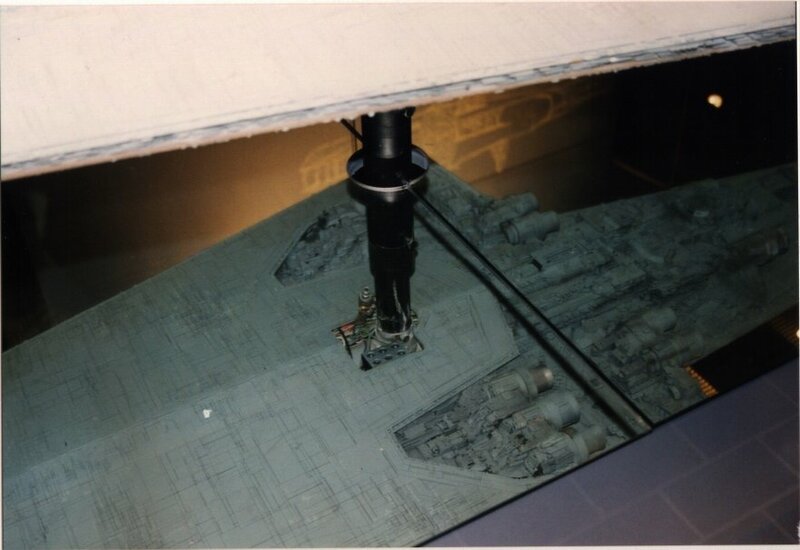 Another perspective from directly behind, but from a different height above the model. 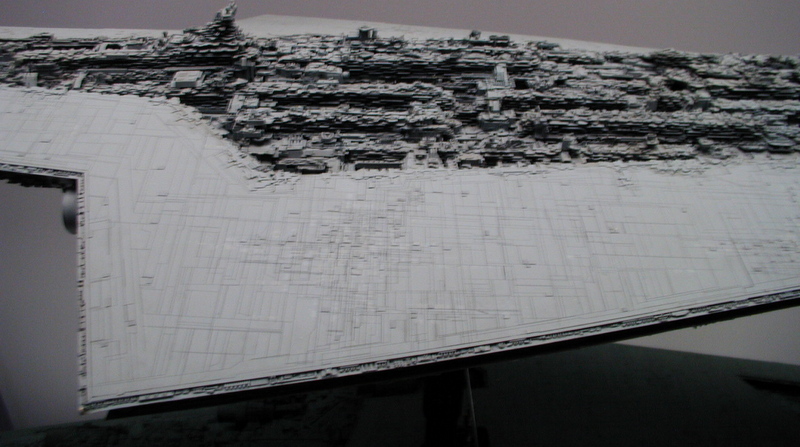 A difficult-to-obtain view of almost the entire ship, from the port side. 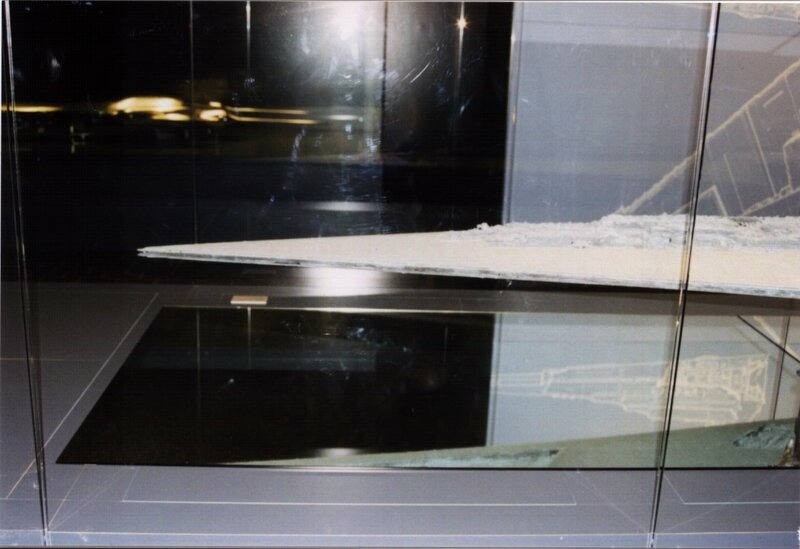 The port side of the display case is against a solid wall. 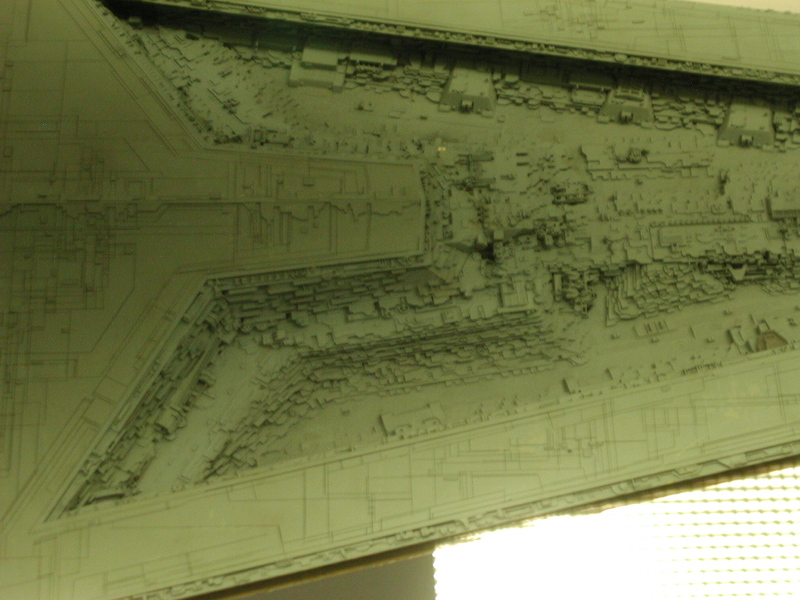 The port side of the model is more detailed than the starboard side; there are extra scanner globes near the bridge tower for instance. 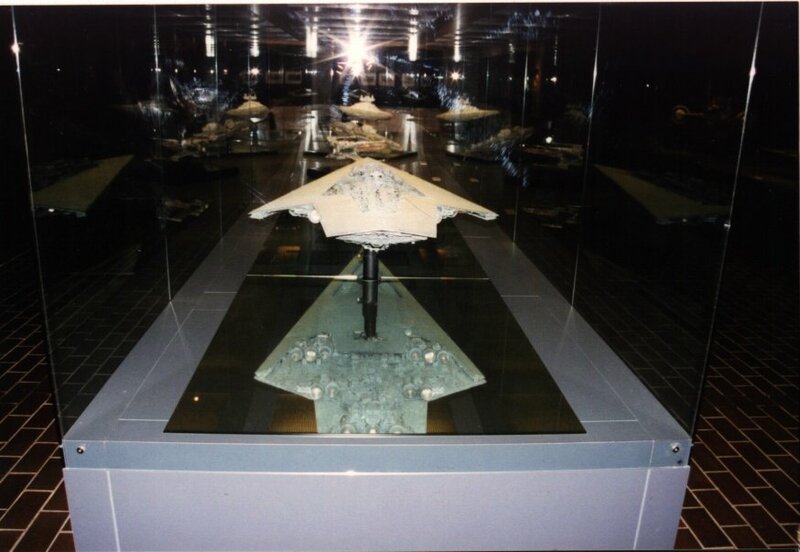 Reflections of the Executor are visible in the mirror below the model and the vertical wall of the display case to the starboard side. Many other elements of the exhibition are visible in the background. Oblique view of the model and its refelction as seen from the starboard side, showing most of the dorsal and ventral corners of the ship except for the end of the fantail. High-vantage view down upon the cortex around the bridge tower. The connections across cortex blocks behind the tower, and the shaft in front of the tower are clearly visible. Details of the dorsal cortex surrounding on the fantail and leading up to the bridge tower. Wide area of the dorsal cortex from the front of the fantail, the bridge tower to the middle of the ship. Front parts of the dorsal cortex. Forward end of the dorsal cortex, and the reflection of the main ventral cavity below. 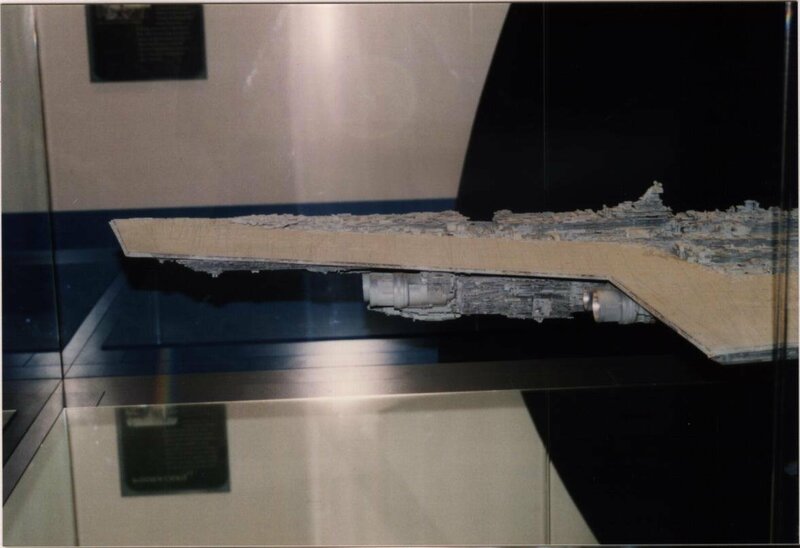 #1 of a series surveying the starboard profile of the ship from an approximately constant height above the plane of the brim trench. 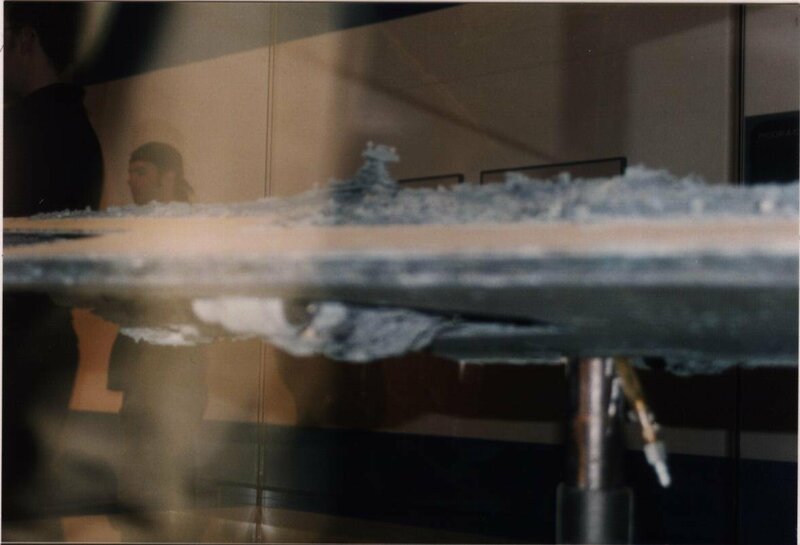 #2 of a series surveying the starboard profile of the ship from an approximately constant height above the plane of the brim trench. #3 of a series surveying the starboard profile of the ship from an approximately constant height above the plane of the brim trench. #4 of a series surveying the starboard profile of the ship from an approximately constant height above the plane of the brim trench. 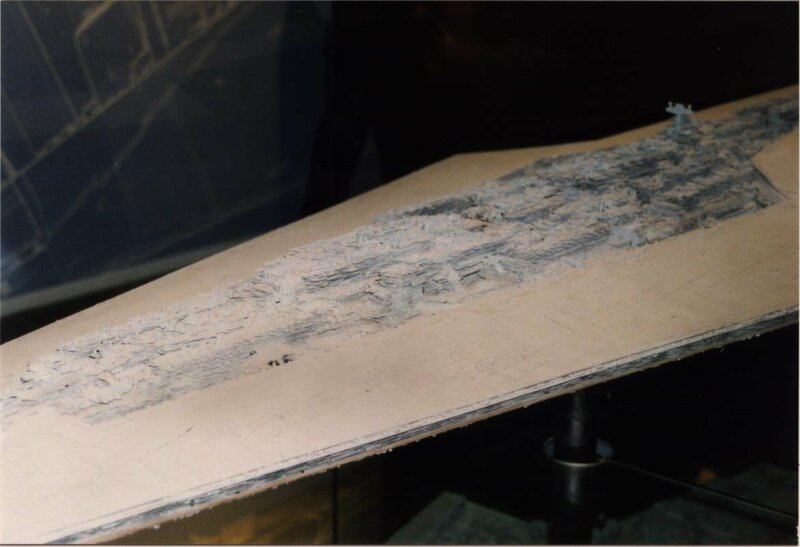 #5 of a series surveying the starboard profile of the ship from an approximately constant height above the plane of the brim trench. #6 of a series surveying the starboard profile of the ship from an approximately constant height above the plane of the brim trench. #7 of a series surveying the starboard profile of the ship from an approximately constant height above the plane of the brim trench. Main ventral cavity and the forward part of the dorsal cortex, seen from the face of the display case at a height approximately equal to the brim trench. Same as above, but with the camera displaced approximately 20cm further towards the stern. 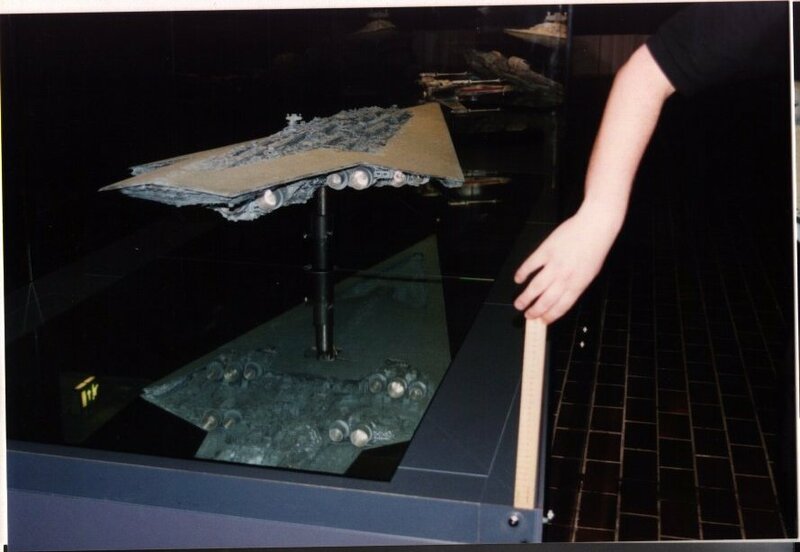 View from approximately the brim height, at the fase of the display case, showing the frontmost of the engines. View from a position beside the apertures of the fantail engines. The transverse gap in the fantail cortex blocks is visible in the profile. The pair of scanner globes behind the bride tower are visible in the upper-right. View from a position between the fantail and middle engine banks. The bridge tower, and the extra globes behind it, are visible in the upper-right. View from just barely behind the position of the middle bank of engines. The forward (wing) bank is visible at the extreme right; the fantail bank is at the left. 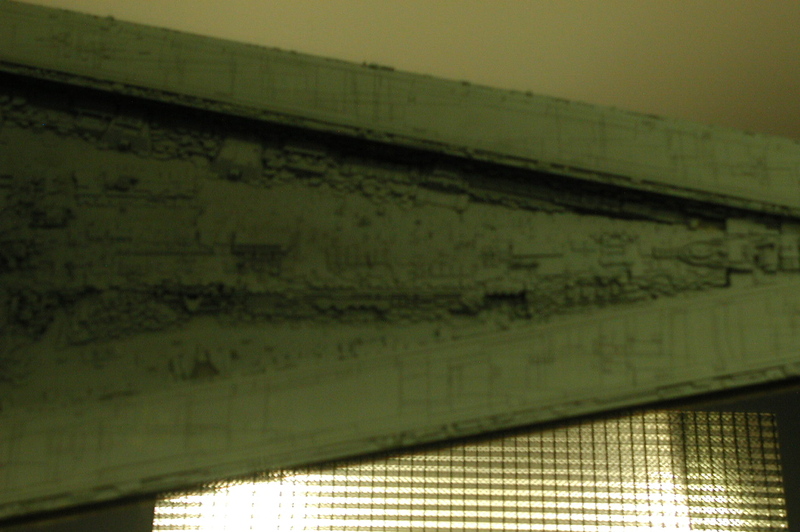 A side view from marginally below the plane of the brim trench, approximately aligned with the aperture of a (forward) wing-bank engine. 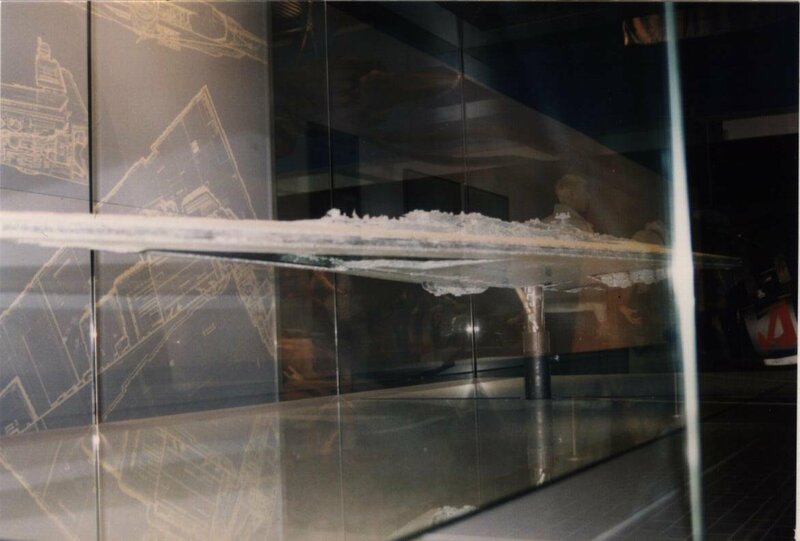 Reflected view of the underside of the fantail, the engines and a substantial portion of the ventral hull. 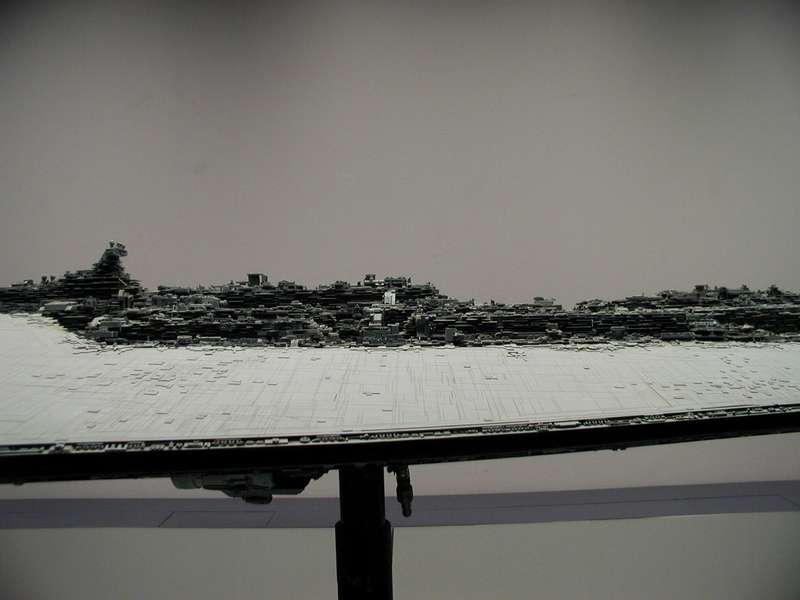 This image was taken from the starboard side of the model, with the camera facing down into the base mirror. The photograph has been rotated half a turn for better visualisation. Note the discolouration suggesting damage to the ventral cortex around the aftmost edges of the fantail. 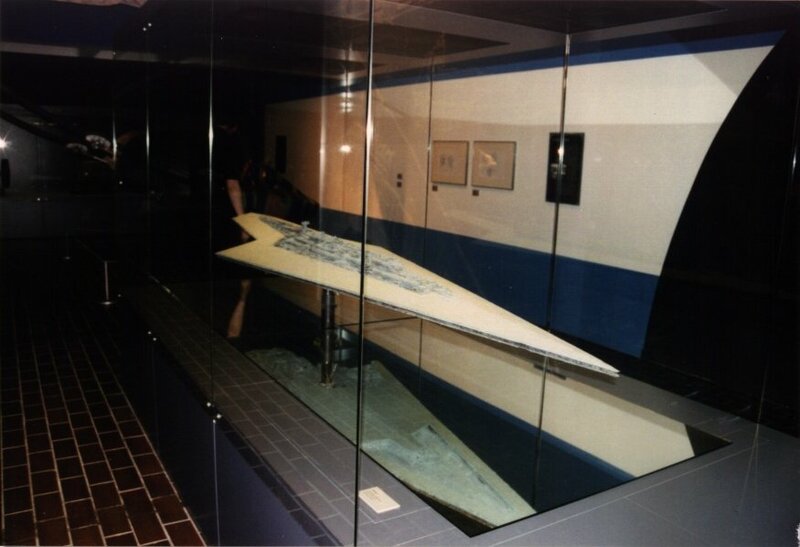 View of the portside engines, taken from the rear of the exhibit case. The three engines of the forward bank are positioned with their axes stepping downwards from the wing towards the keel; the midpoints of the engines follow a gradient similar to that of a transverse section through the ventral hull. The ventral cortex layers under the fantail include some thick horizontal panels (parallel to the midplane of the ship). Like the grain of the cortex, these structures meet the hull at an acute angle. The cortex appears to be damaged near a corner of the fantail (visible in the top right). Close-up of the reflection[?] of the engine-fantail area, showing the extensive detailing of functional modules and terraces of ventral cortex. Close-up of a cavity on the underside of the fantail. Not all of the surfaces of this complex region are visible; some substantial hangar spaces might be hidden inside here. 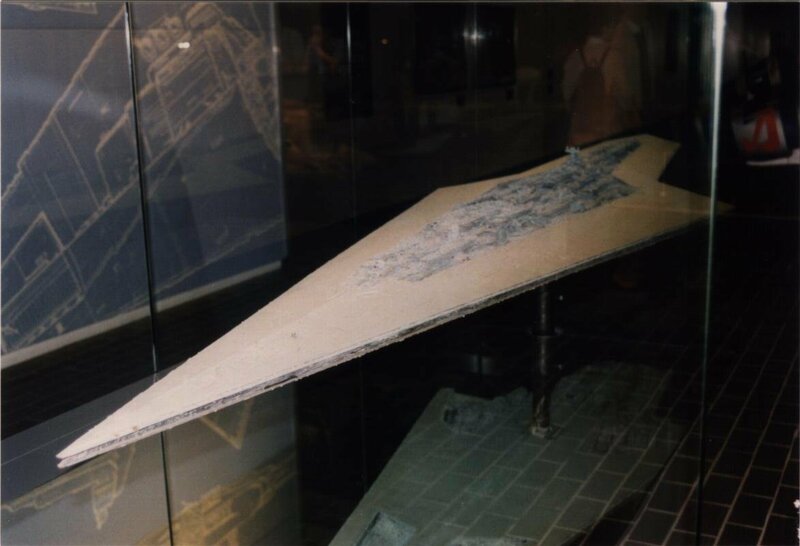 There are also some pairs of rectangular apertures in the horizontal surfaces at either side of the main cavities; these could easily be vertical-access hangars for fighters, shuttles and other small craft. 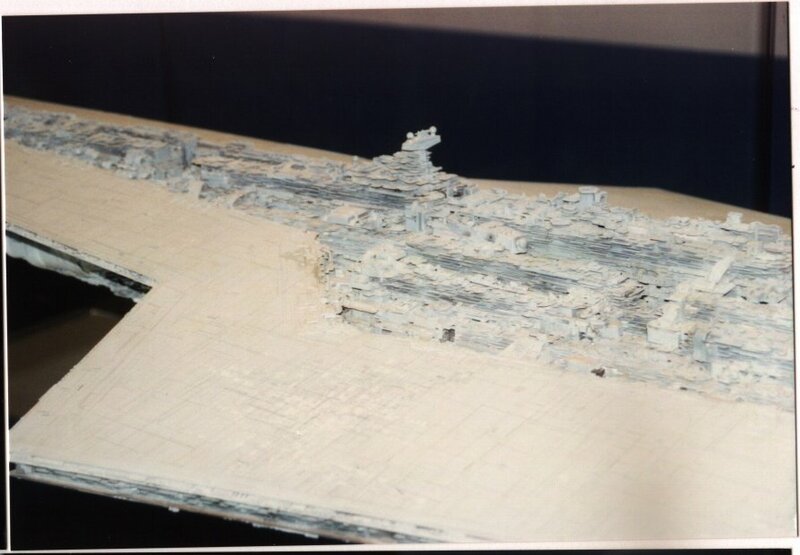 The damaged areas of the fantail are sadly evident again in this shot. 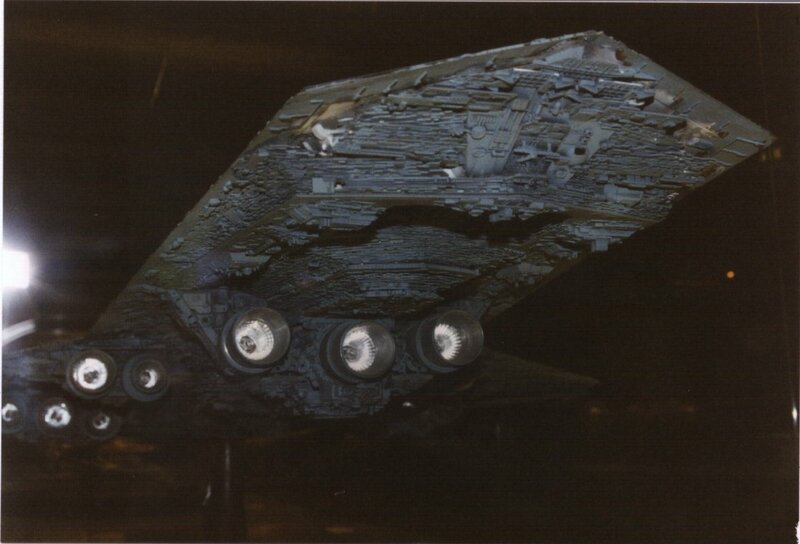 Reflection of the area surrounding the forward bank of engines on the starboard side. 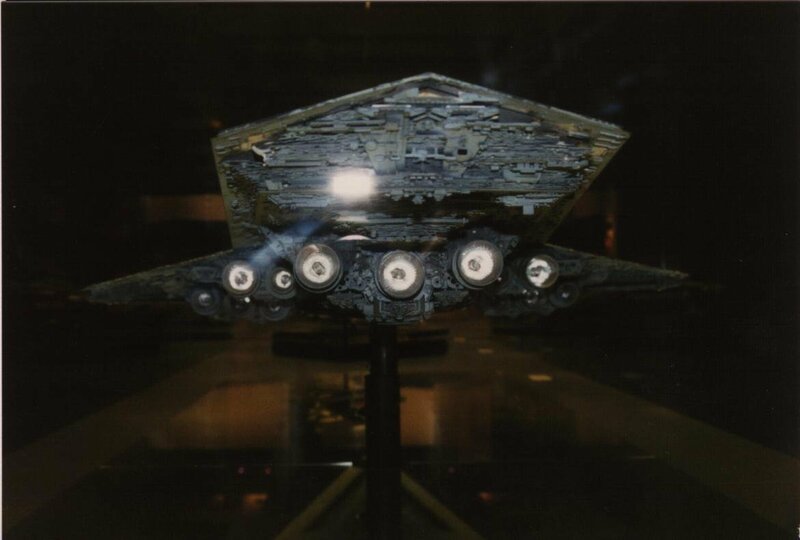 The dark object at the left side of the picture is the model's support armature. Detail of the dorsal surface of the stern; the very tip of the fantail. #1 of a series of three photos of the ventral cavity, taken from the same standing position with the camera pointed in different directions. The bow end of the ventral cavity. 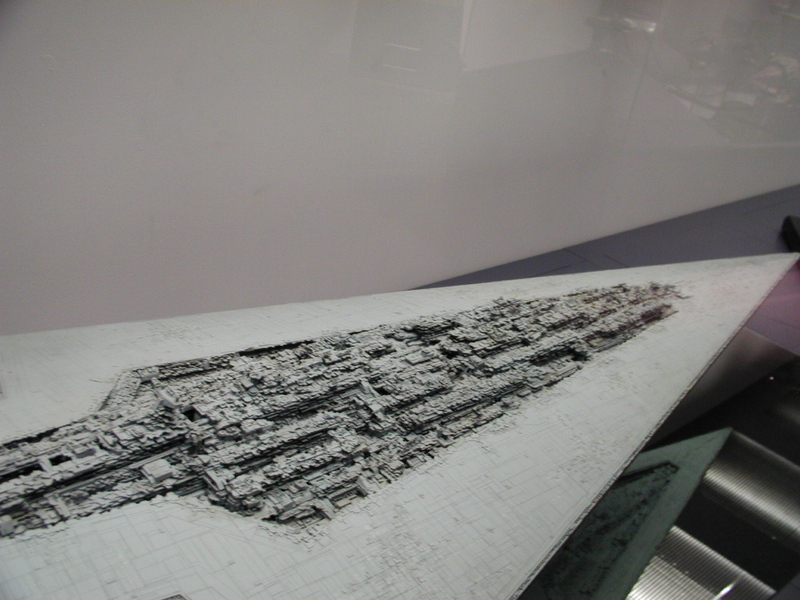 The longitudinal "tongue" on the roof of the cavity reenters the main body of the ship here. 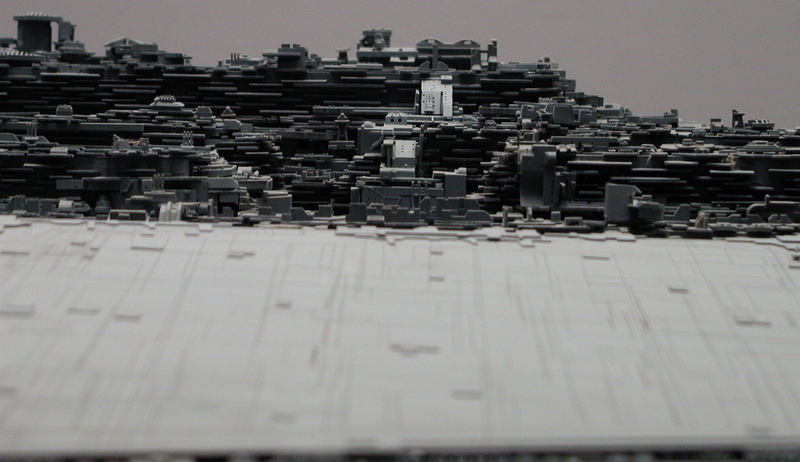 This area includes many regular, symmterical, large-scale pieces in addition to the generic habitable cortex texture. Perhaps an important mechanism of the ship is to be found close to the surface here. May some of the holes and shadows contain hangar spaces? #2 of a series of three photos of the ventral cavity, taken from the same standing position with the camera pointed in different directions. Middle of the cavity, showing the abundance of detail on the longitudinal tongue. Some of the crevices on the sides of the tongue may be large enough to contain hangars. 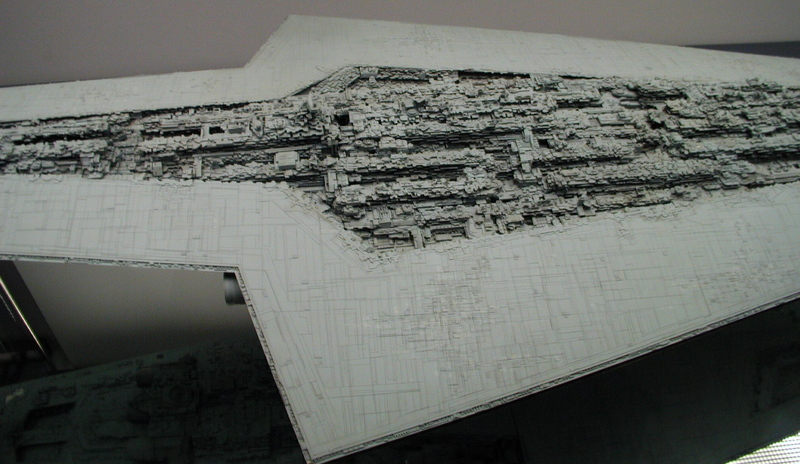 Huge trapezoidal blocks on the side walls of the cavity may be distinctive functional components of the ship. #3 of a series of three photos of the ventral cavity, taken from the same standing position with the camera pointed in different directions. The aft end of the cavity. The trapezoidal blocks are seen in greater detail here. 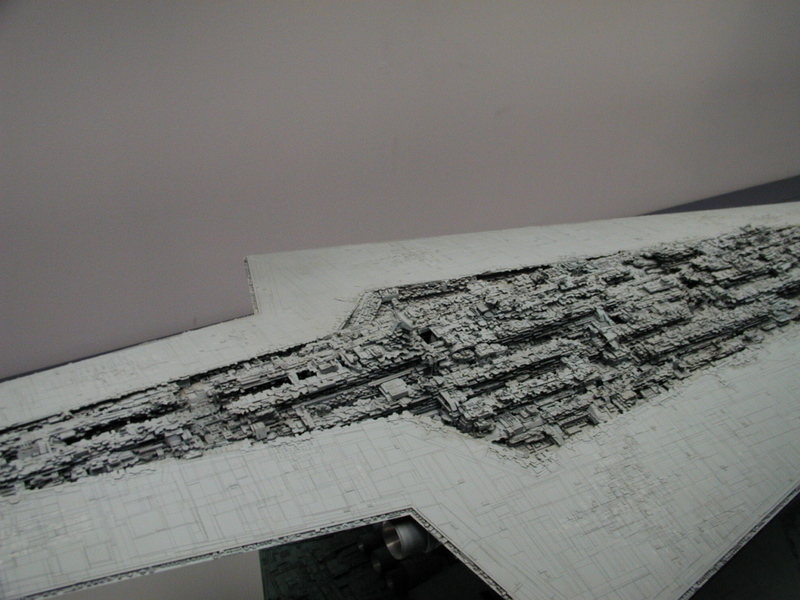 The longitudinal tongue connects with the main body of the ship with a profusion of cortex terraces and some small individually functional elements. Holes in the walls of the terraces may be small hangars or other apertures (less than a few dozen metres). 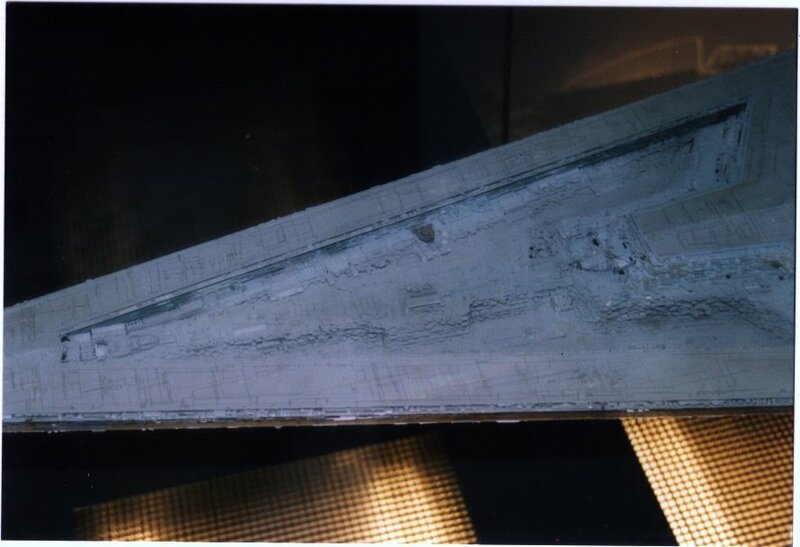 A different view of the reflection of the ventral cavity; with full coverage in the one image. Close view of the brim trench detail, sighted directly laterally from a position alongside the forward point of the cortex. Unlike most of the other photos, this one was taken with a flash. 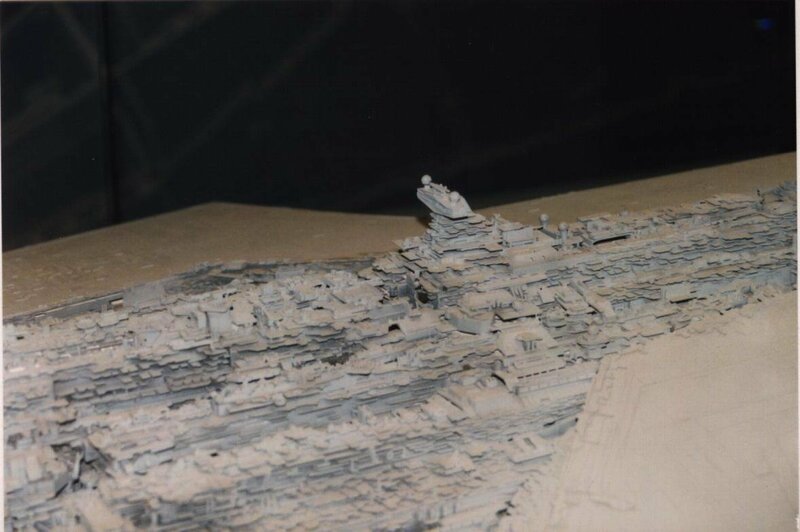 Closeup view of a region of the cortex on the starboard side, forward of the bridge tower. Numerous individual instruments may represent antennae and gun barrels. Close-up of the cortex areas surrounding the bridge tower, seen from the starboard side. A pair of scanner globes is visible a few hundred metres behind the tower; their separation is the same as the tower globes. 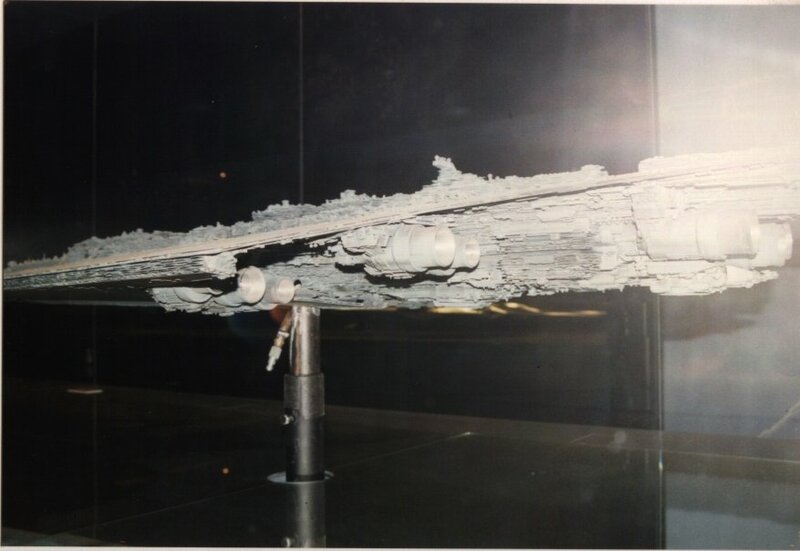 On the unseen port side of the model there are three more globes; they lack partners on the depicted starboard side, but this may not have implications in continuity because the starboard side of the model is generally less detailed. 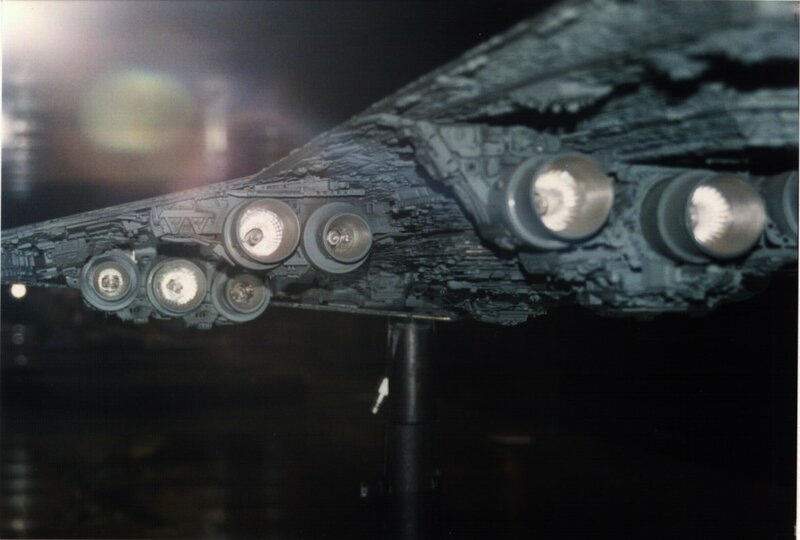 Nonetheless many functional parts are visible throughout the cortex, including some that resemble the barrels of huge cannons. 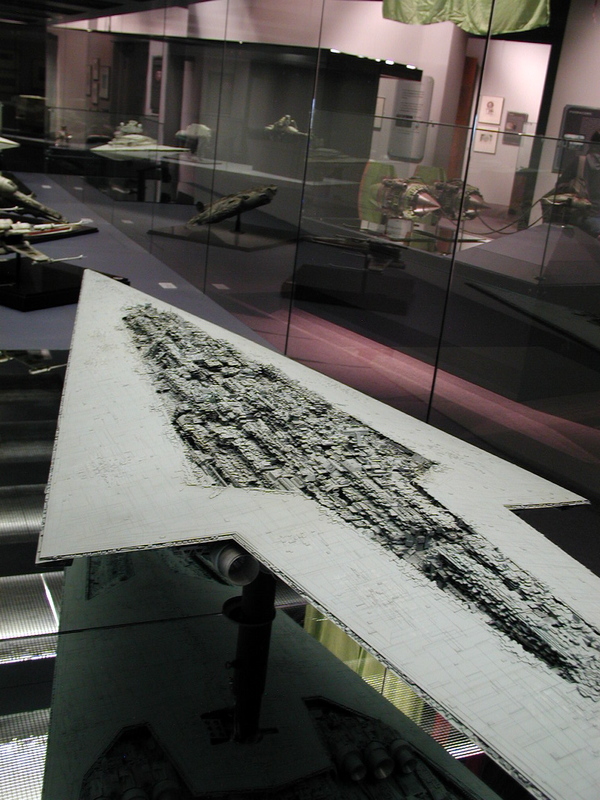 The Art of STAR WARS exhibition is scheduled to appear in the City Art Centre, in Edinburgh, from 23 March to 8 September 2002. 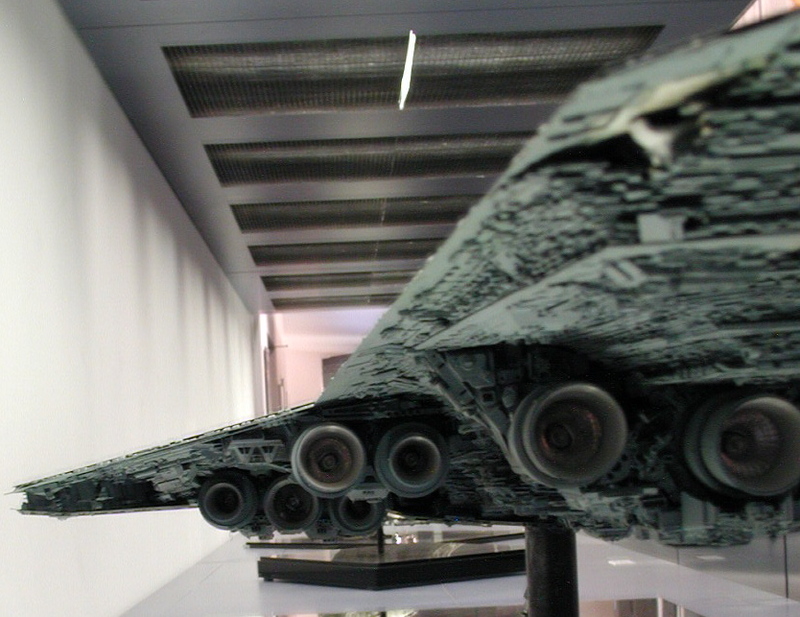 The Executor was there. Photographs will be posted later. Original content is © copyright Dr Curtis Saxton 2002. Last updated 1 June 2002. 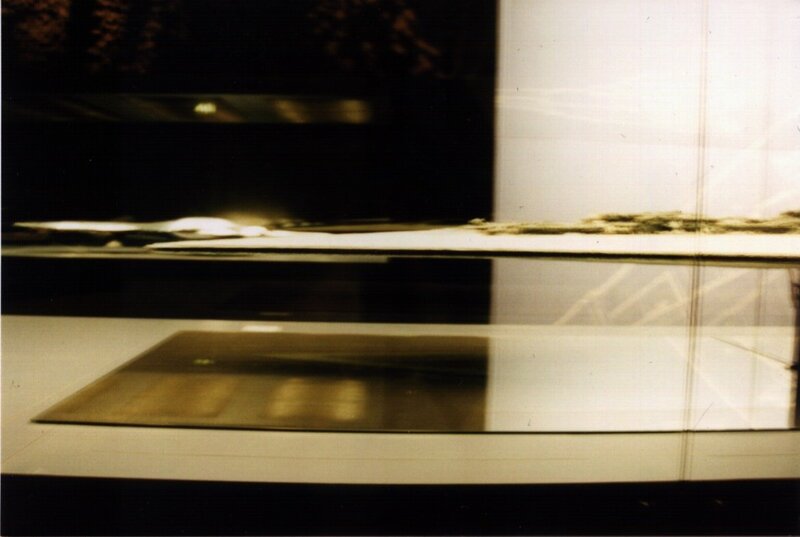 Original photographs from the NMPFT exhibition, within and linked from this page, are © copyright Curtis Saxton 2001.